The battery diagnoses neuropsychological deficits, especially language and communication impairments in subjects with right hemisphere dysfunctions. 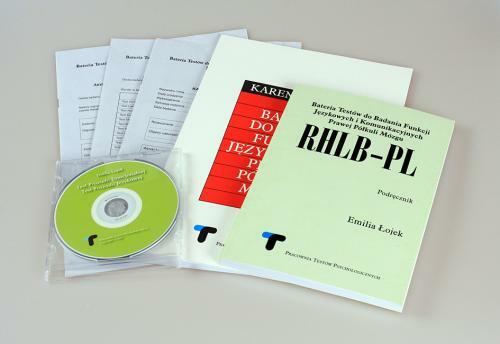 DESCRIPTION: RHLB-PL consists of following 11 tests: Comprehension of Inferred Meaning, Lexical Semantic Comprehension, Verbal Humor Appreciation, Commentaries Test, Picture Metaphor, Written Metaphor, Explaining Picture Metaphor, Explaining Written Metaphor, Emotional Prosody Test, Linguistic Prosody Test, Discourse Analysis. The test material is diverse and consists of: verbal descriptions of various situations (in Inferred Meaning, Humor, Written Metaphor), pictures (Lexical Semantic, Picture Metaphor), a recording of nonsense phrases (Prosody tests). Most aids are in the test booklet, tasks from the prosody tests are CD recorded. The subject has to answer the questions relating to the situation demonstrated in the Comprehension of Inferred Meaning test, to choose a picture fitting the word spoken by the examiner in the Lexical Semantic, to choose the one answer confirming the comprehension of humor and metaphor in the tests which measure them, to indicate the emotional undertone and voice of spoken phrase in the prosody tests. The examiner also writes down spontaneous comments of the subject, asks to explain the metaphors and assesses the discourse. Some test in the battery are preceded by example phrases. RELIABILITY: High stability and congruent reliability, internal consistency – low in healthy persons but satisfactory in clinical groups. VALIDITY: Results confirmed high concurrent validity of the battery, which enables to differentiate between healthy persons and patients with brain dysfunctions of various etiology and damage localization. It is also a useful tool to differentiate between patients with right hemisphere damage and subjects with left-side lesions or dementias of any degree. Factor analysis shows the possibility to group the tests in five relatively independent abilities, which gives additional interpretation angle. NORMS: For subjects with right hemisphere damage. APPLICATIONS: Differential diagnosis in various brain diseases.